This week our blog is on the evolution of climate during the Holocene episode in Pennsylvania. This period follows the Pleistocene or Ice Age and is referred to as the modern era beginning approximately 11,800 years ago. Although, climate change is a very common topic in America and around the world, there is a perception that climate, flora and fauna have not changed substantially since the end of the Pleistocene. The glaciers melted, the megafauna became extinct and modern flora and fauna appeared; there were no substantial changes for the next 11,800 years. Even among archaeologists, that was a common miss-conception until about twenty years ago. In the following, we will describe the shift in climate, flora and fauna during the past 11,800 years and briefly relate this to cultural adaptions. The Holocene is sub-divided into eight climatic episodes and for the reader’s convenience, these are summarized below. This table was originally developed based on pollen studies in Europe and the mid-western United States. The version below was developed by Dr. Frank Vento of Clarion University of Pennsylvania. The cold conditions of the Pleistocene were caused by the changing of the earth’s orbit around the sun combined with changes in ocean currents. The orbit changes approximately every 22,000 years initiating a warm or cold period. This is called the Milankovich cycle. The last change began approximately 16,000 years ago. This was a warming period but it was interrupted approximately 12,900 years ago by the Younger Dryas episode. This episode brought a return to very cold and dry conditions. It may have occurred when the glaciers retreated north of the St. Lawrence River allowing very cold glacial melt water to dump directly into the North Atlantic Ocean thereby depressing the warming effects of the Gulf Stream resulting in cooler conditions. The Younger Dryas lasted approximately 1300 years and seems to have ended quickly around 11,800 years ago. Following that near modern-day temperatures were reached within one hundred years. This marked the beginning of the Holocene episode. The first warming period of the Holocene is called the Pre-Boreal climatic episode and dates between 10,300 and 11,800 years ago. This was a period of transition for the forests of Pennsylvania. Southern animal populations such as bats started moving north and northern animal populations such as lemmings moved even further north into New York. However, the vegetation took much longer to evolve. Pioneer species (trees that spread and grow quickly) filled the open woodlands of the Younger Dryas landscape with pine and spruce trees. The advancement of oak and other deciduous trees took much longer due to their slower migration and growth rates. The dense spruce-pine forest of the Pre-Boreal was similar to forests found in Canada today but different in that there was a greater variety of trees and shrubs. Deciduous trees, such as oak, hickory, chestnut, and maple gradually spread from the south, but these broadleaf trees did not replace the spruce-pine forest until after 10,300 years ago. During the Pre-Boreal (which corresponds to the Early Archaic cultural period), food resources for humans in the form of roots, seeds, berries, and animals were concentrated in developing floodplains in the Susquehanna and Delaware drainages and around swamps and bogs in the Ohio drainage. However, overall this was a less plentiful environment than existed during Paleoindian times. A spruce pine forest simply does not have the nuts, seeds, berries, roots, bird and animal populations that are found in a pine-oak or oak-chestnut forest. 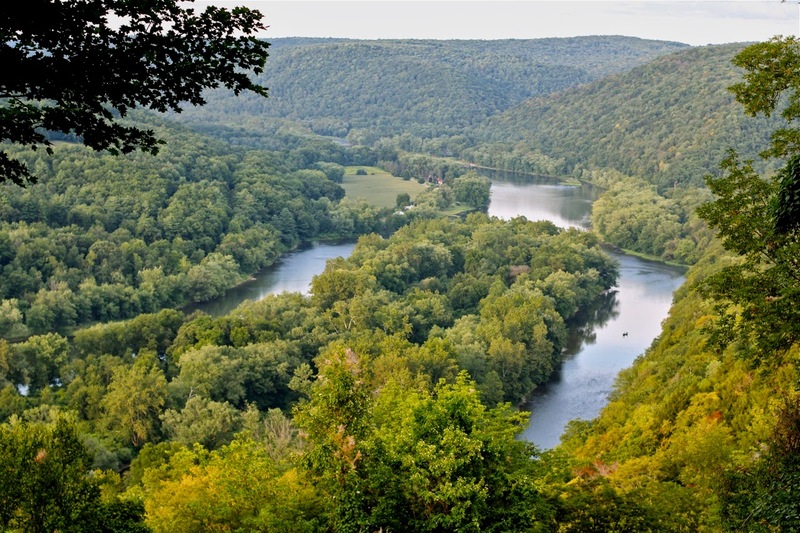 During the Pleistocene, Pennsylvania rivers were very wide, shallow and rocky. They were not bordered by the broad flat floodplains we see today. During the Pre-Boreal episode, the rivers began to stabilize into one channel, and floodplains began to develop. Artifacts that were dropped by the Archaic inhabitants in these settings were covered by subsequent flood deposits. Imagine for the moment that the twelve- or fifteen--foot-high floodplains of today were only three feet high, 10,000 years ago. Artifacts from this time period are found in the deepest levels of these floodplains and only a couple of feet above the water table. By 10,300 years ago, the beginning of the Boreal episode (and Middle Archaic period), oaks and other nut-bearing trees were common throughout the region. This was also a warm and dry episode although characterized by a deciduous, broad-leafed forest. Beginning 9,500 years ago, the Atlantic episode begins, marked by a period of warm and moist conditions similar to the current climate. Overall, the forests were richer in food resources, including walnuts, hickory nuts, butternuts, acorns, and a variety of seeds, roots, and berries. Birds and mammals fed on these resources and themselves provided food for the rapidly increasing human population. However, since human population densities were low, they did not require many specialized tools to exploit this new environment. Beginning about 6,800 years ago, there was an interesting change in weather patterns. 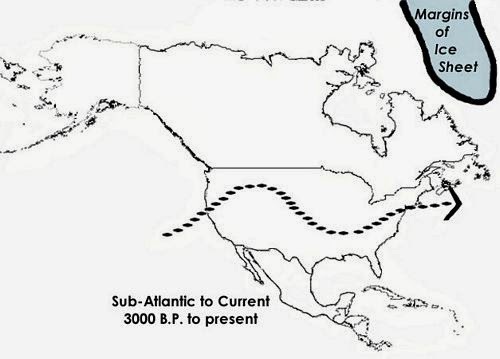 Although the glaciers had retreated well into Canada, they had continued to affect the weather of Pennsylvania and the Middle Atlantic region in general. The presence of a huge mass of cold air (in the form of the Canadian glacier) prevented warm, moist air from moving out of the Gulf of Mexico. By 6,800 years ago, the glaciers had sufficiently retreated north so that a new weather pattern emerged. As a consequence, the Middle Atlantic region began to experience cyclonic storms (hurricanes) and valley-wide flooding. These events are recorded at many archaeological sites as thick layers (several inches) of flood-deposited sands. The Sub-Boreal episode begins at approximately 5800 years ago. This marks the beginning of a warm and dry period; a significant change from the previous 3500 years. The reduction in precipitation would have reduced vegetation levels resulting in an overall drop in food resources and the distribution of resources would have been less predictable. The vegetation of this period begins as an oak and hemlock forest, but the hemlocks nearly disappear rather abruptly being are replaced by hickory trees. Although the drying environment may have been a factor, some believe that disease or blight affected the hemlocks. The hemlock trees gradually return to the forests but it takes over a thousand years for this to occur. It has been long recognized that the Sub-Boreal episode corresponds to the Transitional cultural period. A variety of new and distinctive tools appear during this period, including the first portable cooking containers in the form of soapstone bowls. There seems to be a change in food processing techniques in the form of earth ovens and stone boiling. Trade becomes common over large areas of the Middle Atlantic region. These factors suggest to some archaeologists that people were intensifying their exploitation of the environment possibly to extract more calories from diminishing food resources. However, archaeologists also debate over how dry the climate was and whether this had a significant effect on food foraging strategies. 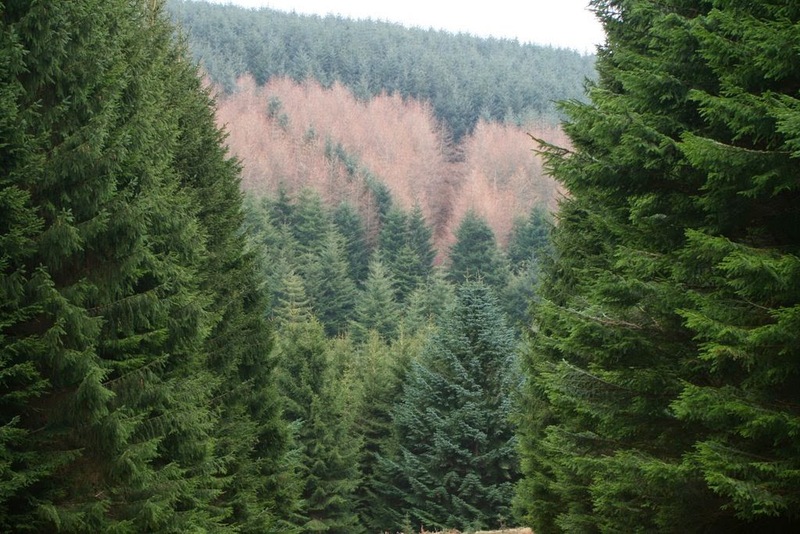 Some believe that the effect was minor and reference the pollen record which shows little significant change in vegetation (other than the replacement of hemlocks by hickory). Other archaeologists use increased rates of flooding to assert that there was a sufficient reduction in rainfall to reduce ground cover, which resulted in greater runoff, erosion, and flooding during heavy rains. The issue has not been resolved, but there are an increasing number of sites that support the increased flooding scenario. The Sub-Boreal period ends at 2850 years ago; the Sub-Atlantic episode begins and there is a return to warm and moist conditions. Food resources increase. This corresponds to the Early/Middle Woodland period. These conditions stabilized floodplain environments by reducing the frequency of floods, although large floods from hurricanes continued. Over the next thousand years, there are a series of small changes in the climate. During this time, most of Pennsylvania was covered with an oak chestnut deciduous forest with an abundant variety of foods for humans. Preferred floodplain settlements were so frequently used by Native Americans that the locations became meadows with small trees, rather than climax (fully mature) forests. 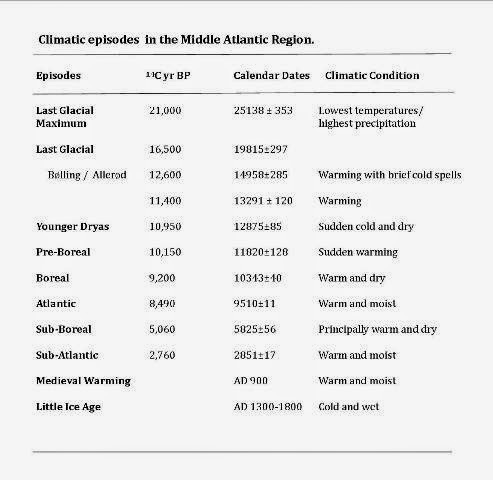 Beginning at approximately 900 AD, the climate warms and this is known as the Medieval Warming period. The advantages of this change are recorded in Europe and Asia. During this time, agriculture spreads into northern Europe and the Vikings settled in Greenland. The favorable conditions of the Medieval Warming in eastern North America allowed for a greater dependence on agriculture and its final spread into the Upper Ohio basin, Ontario, New England and eventually the river basins of eastern Pennsylvania. Agricultural hamlets and villages spread and grew in number throughout this region. The following episode, known as the Little Ice Age (1300 AD – 1800 AD) is also chronicled by European historians when the trends of the Medieval Warming were reversed. The Vikings abandoned Greenland (and the possibility they would get credit for discovering the New World) and generally, there was a retreat of agricultural peoples into warmer climates. During this time in North America, several major cultural complexes experienced periods of instability and eventual collapse: the pueblos of the Southwest were abandoned as was Cahokia in the Mississippi Valley, hyperlink http://cahokiamounds.org/. In the Ohio Valley of western Pennsylvania, site distributions were adjusted during this time. Interestingly, changes in the eastern part of the state are not as apparent. One of the more noted accounts of harsh conditions during the period occurs during the winter of 1776 at Valley Forge. General George Washington and his troops were forced to retreat to the north of Philadelphia after the city was occupied by British forces. Lack of food, poor shelter and insufficient uniforms resulted in sickness and death for the Continental forces. 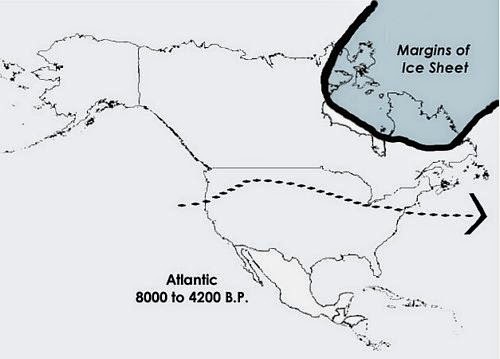 The end of the Little Ice Age occurs at about 1800 AD, and is also marked by another wave of immigration to North America. We hope you have found this journey through the evolution of climate change in Pennsylvania interesting. Understanding and exploring our archaeological heritage is crucial to our understanding of human behavior and our ability to change and adapt over time. Closing out the school year once again, the Archaeology Section of the State Museum of Pennsylvania returned to Cedar Cliff High School (West Shore School District, Cumberland County, Pennsylvania) to assist with a three week simulated archaeological project as part of Mr. Daniel Reilly’s AP World History class. 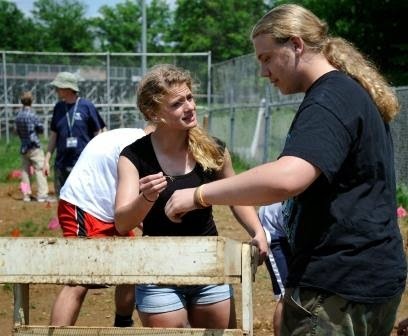 Through this innovative program students learn hands-on about archaeology at a simulated site near the high school's sports stadium. For these students the multi-disciplinary skills built here integrate well with other classes in science and mathematics. The students began with several days of classroom related work where they were taught the difference between archaeology and paleontology; that archaeology is a subfield of anthropology – the study of human cultures; the nature and significance of stratigraphy; and the importance of archaeological context or the location of the site and the three dimensional location of the artifacts within it. The State Museum recently received a new data recorder which was generously donated by Productivity Products and Services, Inc. in Saxonburg, Pa. This recorder replaced one that was nearly 20 years old and no longer functioning. This donation allowed us to demonstrate current data collection methods and produce detailed and accurate site maps of the excavation. The field work portion of the project concluded allowing students to prepare their reports. Each team was responsible for taking detailed field notes to document the location of features and the artifacts found in them. In the lab, the artifacts will be examined and a report developed that documents the methods and the findings. The students enjoy finding “stuff”, but they will also enjoy weaving the story of how the artifacts ended up at the site. Each student’s excavation report will include a review of excavation methodology, an analysis of recovered artifacts, conclusions drawn about each “culture” based on that analysis, and a recommendation for further work at 36CU0210. Archaeology is a multidisciplinary study and allows teachers to demonstrate basic principles of science, geology, biology, mathematics, history and anthropology. 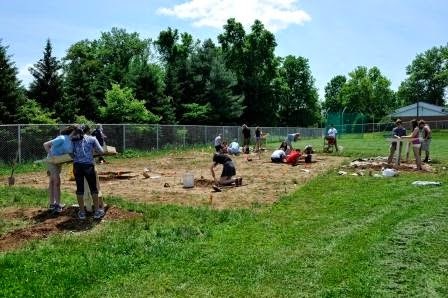 Simulated archaeological projects can be a learning and entertaining experience for the students where they use archaeological data in a multidisciplinary program to develop critical thinking skills. The public frequently feels that archaeologists guess or speculate about how people behaved in the past. In fact, archaeology is a science and archaeologists develop hypotheses which are tested at archaeological sites. A simulated archaeological project demonstrates a systematic approach to scientific discovery and it emphasizes behavior rather than artifacts. Participation in this project and other outreach programs provides an opportunity for staff at the State Museum to educate the public in understanding archaeological methods and improves the image of how archaeology is accomplished. In summary, an archaeological field experience for high school students allows teachers to answer the age old question often asked by students when taking science math, etc… – “Why do we have to know this stuff?” This experience leads students to see a direct application of how other disciplines tie into creating the ‘big picture’ and allows them to understand why all learning is important. This week the letter “G” represents a commonly, but most likely misused term in archaeology: ‘gorget’. The issue with using the term ‘gorget’ to describe these, “relatively flat, variously shaped, ground, and polished [stone] many times with one or two holes drilled through their breadth” is that we do not know how they were actually used (Curren 1977). As defined by the Merriam Webster dictionary, ‘gorget’ suggests that these artifacts were some form of armor or an ornamental collar for the throat. However, there is not enough evidence to suggest the use of these artifacts as defined above, and consequently, the true function of gorgets proves to evade archaeologists to this day. In the following, a few ideas on the use of gorgets are discussed. 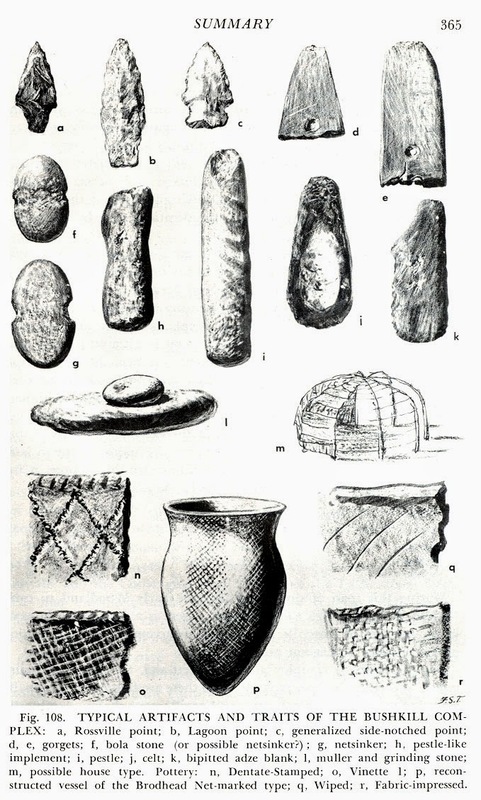 Typical artifacts of the Bushkill Complex, including at top left, gorgets. In much of the Northeast, stone gorgets appear in the archaeological record during the Early to Middle Woodland period (2800 B.P. - A.D. 1000), specifically between 2800 B.P. and A.D. 0 (Custer 1996). For example, Kinsey (1972) reported gorgets from the stratified Faucett in Pike County, along the Delaware River. These were associated with the Early Woodland Meadowood Complex and the Middle Woodland Bushkill Complex. 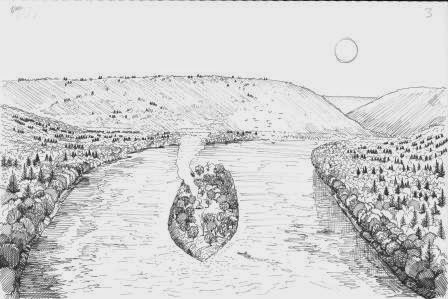 Also, appearing during the Early to Middle Woodland period are burial mounds, burial ceremonialism, fired clay pottery, tubular smoking pipes and widespread trade in Pennsylvania (Witthoft 1949, Custer 1996). An early idea on gorget use is that of archery armguards. 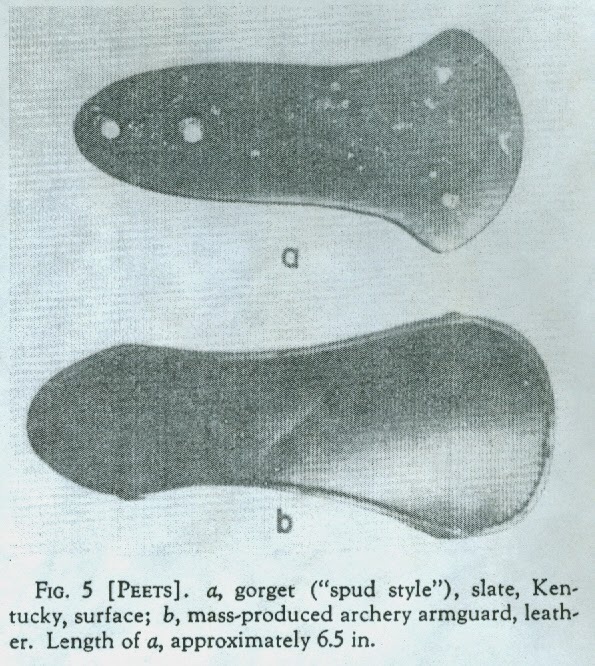 Orville Peets (1965) lays out the idea that as armguards, some of the stone gorgets, those known as “spud-style gorgets” (1965:115) are similar in shape to modern armguards, and through some experimentation he was able to show that the stone gorgets did in fact work well for such use. On the other hand, a lack of wear in the holes of stone gorgets and the numerous forms and shapes of these artifacts suggests that some other use is also likely. 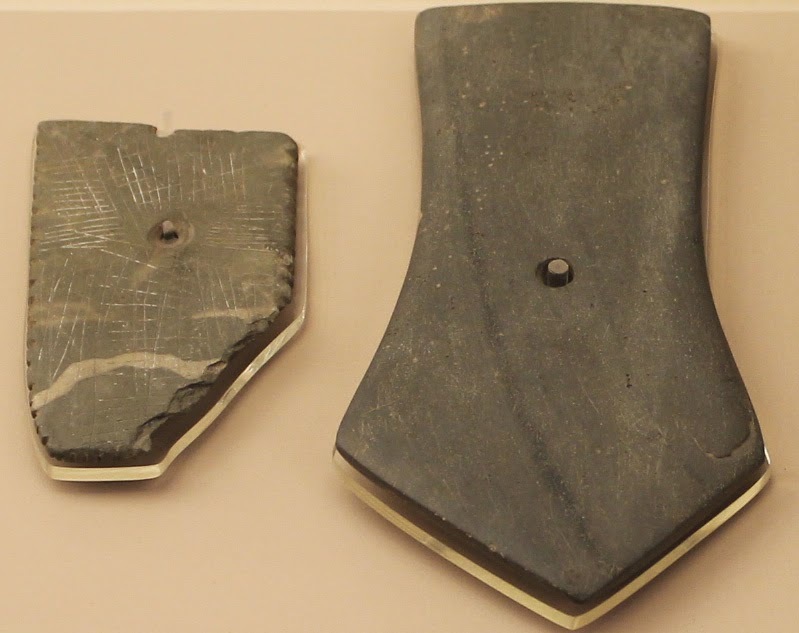 Another theory on the use of gorgets is provided by Cailup Curren, Jr. (1977) who suggests that, since the introduction of stone gorgets correlates to the introduction of pottery, these artifacts were used as tools in pottery making. In justifing this hypothesis, Curren compares native stone gorgets to modern ceramic tools called ribs. The modern ribs are often constructed of wood and have a similar shape to the native stone gorgets, with beveled edges, various shapes, and drilled holes for a better grip for the potter when the clay is wet. 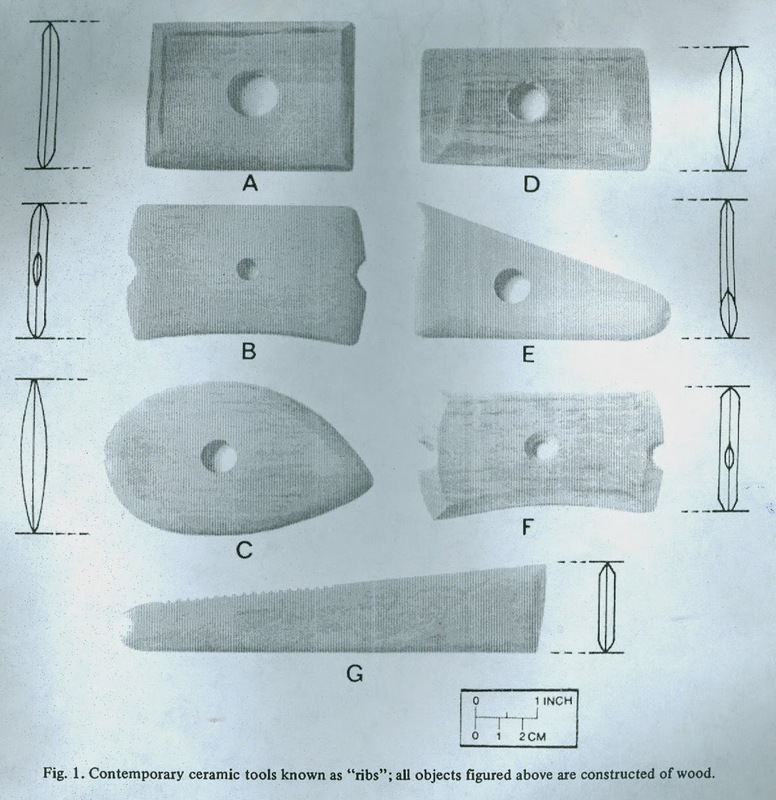 Though native gorgets and modern ribs are in fact very similar in shape and form, Curren does not provide any other archaeological evidence indicating that the stone gorgets may have been used for this purpose, says William Starna (1979) in his article commenting on Curren’s hypothesis. ﻿﻿Starna points out that Curren has fallen into the common practice of identifying functionality of native artifacts based solely on the “morphological similarity” to modern devices with limited or no archaeological evidence (1979: 337). In fact, he makes it a point to refer to William Ritchie’s (1969) writing that indicates, “In a large area of the Northeast, stone gorgets totally disappear, never to reappear… while ceramics continue unabated” (Starna 1979 and Ritchie 1969). Though he disagrees with Curren’s hypothesis, Starna does provide his own theories on the use of stone gorgets. As mentioned above the appearance of stone gorgets and burial ceremonialism also both occurred in the early to middle Woodland period. This idea is followed by Starna, suggesting that gorgets may have held importance for status or trade goods. This hypothesis is supported by the finding of gorgets with a number of burials. 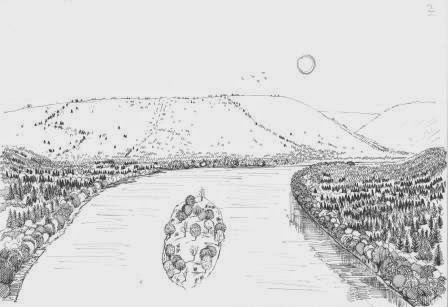 Starna references the early late Woodland Riviere au Vase site in southeastern Michigan which, “… two burials exhibit a not atypical placement of stone gorgets with deceased individuals” (1979: 339). Also noted by Starna (1979), is that with the declining frequency of burial ceremonialism so does the appearance of stone gorgets and other grave ceremonial items decline. 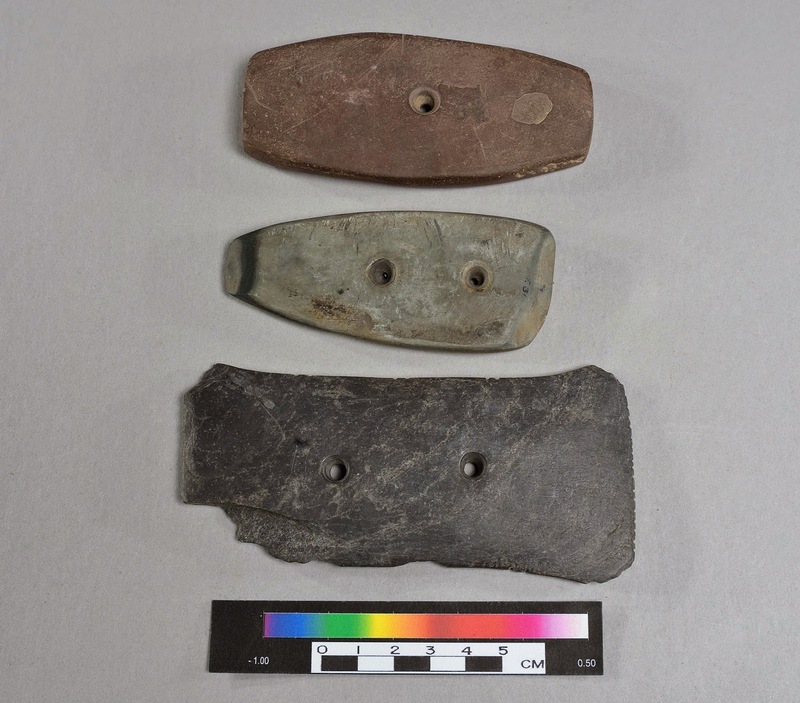 Archaeological investigations in the Ohio River Valley of Pennsylvania have produced sufficient quantities of gorgets to examine their placement, form and distribution. The pentagonal form is an elongated shape with a pentagonal end, often of fine grained banded slate, with a single hole placement at the upper end. This specific form is represented in much lower quantities when compared to other gorget forms, and to date are associated with mound sites. Its recovery, primarily in western Pennsylvania, has enhanced our understanding of this artifact as a symbol of social rank or status. Its distribution through Ohio, Pennsylvania, and New York is also an indicator of the significance placed upon it within the trade network of the Hopewell Culture. One example in which gorgets, including the pentagonal form, have been found is the Sugar Run Mound site (36Wa0359) in Warren County Pennsylvania (McConaughy and Johnson 2003). This mound site includes more than forty burials, many of which include grave goods, and a few with rectanguloid and pentagonal gorgets. The burials containing gorgets tended to have a higher quantity and variety of grave goods than others without, suggesting a higher status or social rank of these individuals. Gorgets in the mid-Atlantic region more commonly appear in stone as those mentioned above are, but also appear in lesser quantities in shell, copper and bone. The introduction of brass and silver gorgets by European traders to native peoples served as a replacement for the traditional form. Its role in demonstrating status may have continued as suggested by the number of historic prints depicting tribal leaders adorned with gorgets. Here we have provided some thoughts and ideas on how gorgets were used. Now it is up to all of us to use what we know, find more archaeological evidence, and continue the research and hopefully one day we will more fully understand this artifact in our efforts to preserve and protect our past for the future. Prehistoric Cultures of Eastern Pennsylvania. Pennsylvania Historical and Museum Commission, Harrisburg. Archaeology in the Upper Delaware Valley. Pennsylvania Historical and Museum Commission, Harrisburg. Sugar Run Mound (36Wa359) and Village (36Wa2): Hopewell/Middle Woodland in Warren County, Pennsylvania. Foragers and Farmers of the Early and Middle Woodland Periods, edited by P. Raber and V. Cowin, pp. 101-116, Recent Research in Pennsylvania Archaeology Number. 3, Pennsylvania Historical and Museum Commission, Harrisburg. What, Really, Were Gorgets?. American Antiquity 31(1): 113-116. The Archaeology of New York State. Natural History Press, New York. A Comment on “Curren’s Potential Interpretations of ‘Stone Gorget’ Function”. American Antiquity 44(1): 337-341. 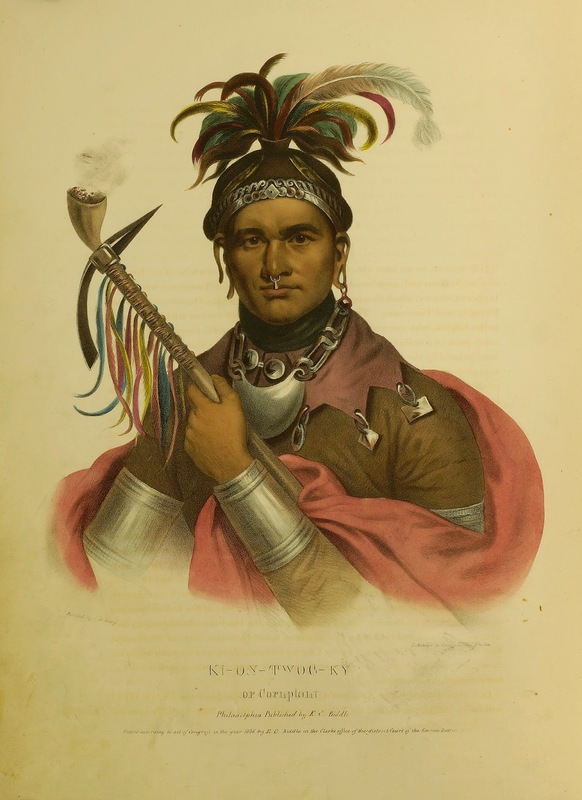 An Outline of Pennsylvania Indian History. Pennsylvania History 16(3): 165-176.